F. Murray Abraham in "The Merchant of Venice"
World Premiere of "The Laramie Project: Ten Years Later"
The inaugural season of international theater programming by ArtsEmerson: The World on Stage was announced this week at a press conference held onstage at the beautifully refurbished Paramount Theatre in Boston’s historic Theatre District. 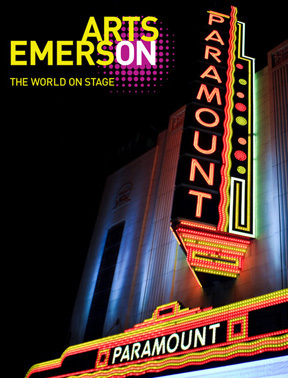 ArtsEmerson is the organization established by Emerson College to program the Paramount Theatre, Cutler Majestic Theatre and other venues at Emerson’s Paramount Center. The announcement was made by Robert J. Orchard, appointed Executive Director of the Arts in October 2009, along with the President of Emerson College, Jacqueline W. Liebergott. The season includes more than 100 performances of 17 different productions, including world premieres, Boston debuts and works to be developed in the new facilities created by Emerson College. The four distinct performance venues include: the beautifully re-imagined 590-seat Paramount Theatre, a cornerstone in the revitalization of downtown Boston; the versatile, intimate Black Box Theatre, which can seat up to 150 people; the state-of the art 170-seat Bright Family Screening Room (all located within the new Paramount Center); and the historic 1,186-seat Cutler Majestic Theatre in the heart of the Theatre District, fully restored by Emerson in 2003. The Paramount Center also includes a new, full scene shop, rehearsal studios and soundstage. These support spaces will allow for the development of new work, and the establishment of multi-year relationships with some of the world’s most celebrated makers of Theatre. Orchard commented that he's grouped his artists into three programming streams: legends, pioneers and family. Legends are established, highly regarded companies and artists whose work is celebrated around the world, such as The Abbey Theatre, The New York Theatre Workshop, Peter Brook, Tectonic Theater Project and F. Murray Abraham, among others. Pioneers include a new generation of artists whose ideas are redefining theatre, such as Elevator Repair Service, 7 Fingers, Rude Mechs and Basil Twist. Finally, the group will also host a wide variety of performances for people of all ages. Some of these works will be developed at the Paramount Center for Boston audiences and then travel the world. Due to the diversity of performance locations and the various seating arrangements, ArtsEmerson is not offering subscriptions, per se. However, replacing that will be annual Memberships to ArtsEmerson, offered at $60. Members will receive one free ticket, substantial discounts, standby seating upgrades, plus access to tickets before they go on sale to the general public. Members will also receive special access to residencies and workshops, designed to offer audiences insights into works in development, and the opportunity to provide feedback. Tickets for Booking Period One (all performances through the end of 2010) are available to members now, and will go on sale to the general public July 26. Tickets for Booking Period Two (performances January—May 2011) will be available to members beginning October 1, and will go on sale to the general public November 1. In addition, ArtsEmerson offers specially-selected member packages, including All for Fall (six projects starting at $199), Family Pack, Pioneer Pack and Legends Pack. For details about membership and tickets, visit www.artsemerson.org or call 617-824-8000. Packages are designed to give audiences flexibility in designing their own season. "Fraulein Maria" is Rodgers and Hammerstein’s "The Sound of Music" as deconstructed by the brilliant mind and playful spirit of acclaimed choreographer Doug Elkins. A gender-bending, tour-de-force comedy, "Fraulein Maria" began as a love letter to Elkins’ children, on a tiny stage at Joe’s Pub at New York’s Public Theater and has turned into a bona fide family tradition. Set to the original Julie Andrews soundtrack, Elkins’s affectionate humor shines through his idiomatic tips of the hat to such dance legends as Martha Graham, George Balanchine, Jose Limon, Paul Taylor and Merce Cunningham. The von Trapp children are hoodied hip-hop dancers; cross-dressing nuns cavort across the stage. He seamlessly merges modern and popular dance forms, reinventing this beloved 1965 standard into an edgy yet fun cabaret romp. Recommended for everyone, including children 5 and older. 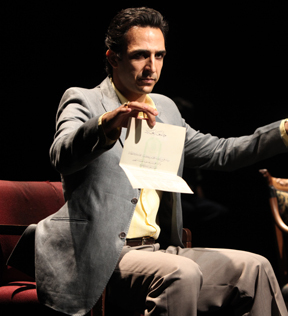 The creators of one of the most important plays in recent times make their Boston debut. In October 1998 Matthew Shepard was kidnapped, beaten and left to die, tied to a fence on the outskirts of Laramie, Wyoming. Five weeks later, members of the Tectonic Theater Project went to Laramie, and over the course of a year, conducted more than 200 interviews with townspeople. From these interviews they wrote "The Laramie Project," one of the most-performed plays in America today. Recommended for age 14 and up. 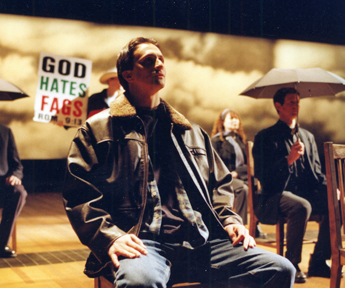 ArtsEmerson will also present the world premiere of "The Laramie Project: Ten Years Later." Members of Tectonic Theater Project returned to Laramie to find out what happened in the 10 years since Matthew Shepard died. They asked the questions: Has Matthew's murder had a lasting impact on that community? How has the town changed as a result of this event? What does life in Laramie tell us about life in America 10 years later? From the interviews, they wrote an Epilogue for the original play, and in the fall of 2009, on the 11th anniversary of Matthew’s death, companies all over the world performed staged readings. This will be the first full stage production, presented in repertory with the original. Recommended for age 14 and up. 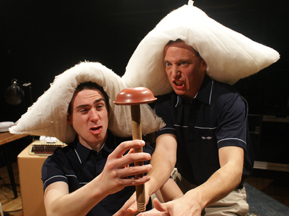 "One Small Step," launched at the 2008 Edinburgh Fringe on the 40th anniversary of the moon landing, garnered rave reviews and thrilled audiences. Two extraordinary young actors, using little more than cardboard boxes, buckets and a thermos, recount the history of moon travel, taking the audience on an action-packed trip involving 41 characters, in an inventive exploration of the space race. From the first dog to be rocketed into space, to the moon landing and beyond, "One Small Step" is full of epic achievements and humor. Recommended for everyone, including children 6 and older. March 20, 2003, the day that President Bush announced the invasion of Iraq, changed the lives of ordinary Iraqis forever. In June 2008, Jessica Blank and Erik Jensen, award-winning creators of "The Exonerated," traveled to Jordan to find out what happened to Iraqi civilians who escaped in the wake of the War. They interviewed some 35 people -- a cross-section of lives interrupted -- who fled the chaos and violence that befell Iraq for the relative safety of Jordan. Following their visit, these encounters were crafted into a vivid, illuminating and unforgettable play that gives voice to the upheaval of everyday life in a country struggling to find its way back home. "Aftermath" reveals a truth, charged with emotion, outrage, and in the end, lessons in courage and humanity. Recommended for age 14 and up. 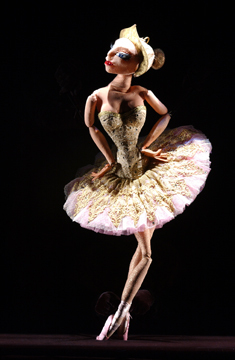 Known the world over for his astonishingly innovative puppet shows, master puppeteer and Guggenheim Fellow Basil Twist spins new magic around the legendary Ballets Russes production. Set to Stravinsky’s classic score, it’s the story of a tragic love triangle between three magical creatures; the clown Petrushka, the alluring Ballerina and the dashing Moor, whose stories emerge amidst the swirl of the Russian carnival. The program opens with an abstract fantasia of puppetry set to Stravinsky's "Sonata for Two Pianos," performed by Russian identical twin pianists, Julia and Irina Elkina. Nine hidden puppeteers combine Czech and Japanese traditions in a tour de force of music, movement, design and storytelling. Recommended for everyone, including children 7 and older. Co-presented with The Celebrity Series. In 1871, working class Parisians overthrew the French government, declared Paris autonomous and launched an attempt to reinvent society. Inspired by an actual concert that took place in the overthrown imperial palace at the height of the uprising, this memorable musical employs a bold theatrical form to tell the story of the first socialist revolution in Europe. The acclaimed New York theatre ensemble uses found texts, original songs from the time period, and the cabaret form to tell the story of this extraordinary event that re-imagined an entire culture. Recommended for age 14 and up. In this world premiere by Katherine Bates, the aged Rose Kennedy prepares herself for a pressing interview by revisiting her past through the eyes of her youth and middle-age. Her candid reflections paint a unique and fascinating picture of a legendary family through the lens of its least-known yet most important anchor, Rose. Recommended for age 12 and up. Produced in collaboration with the Performing Arts Department at Emerson College. 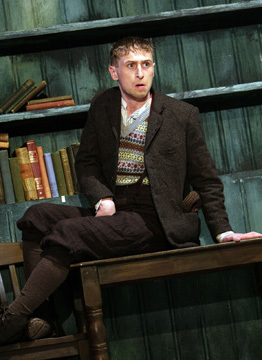 "The Cripple of Inishmaan" is a quintessentially Irish comic masterpiece with eccentric island characters trading stories to within an inch of their lives while a young man tries to make sense of who he is. This production revives the unique partnership of the Druid ensemble with writer Martin McDonagh and director Garry Hynes. It’s 1934 and the sleepy island of Inishmaan is abuzz with the news that Hollywood filmmaker Robert Flaherty has arrived on the neighboring island of Inishmore to film his movie "The Man of Aran." For orphaned Billy Claven, who has been relentlessly scorned by Inishmaan's inhabitants, the film represents an escape from the poverty of his existence. He vies for a part in the film, and to everyone's surprise, it is the cripple who gets his chance. Recommended for age 12 and older. Ireland’s famed Abbey Theatre presents its most acclaimed recent production - Mark O’Rowe’s "Terminus." A vivid and exhilarating play, "Terminus" is a tale of three people ripped from their daily lives and thrown into a fantastical world of serial killers, avenging angels and love-sick demons. As their stories progress, the narratives begin to intersect and crisscross, and their emotions, yearnings, and desires simmer and occasionally explode. Recommended for age 16 and over. 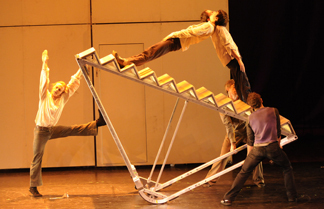 Elevator Repair Service thrilled Boston audiences with "Gatz" this past season at the A.R.T. They'll return to Boston with a very different production – a single-sitting adaptation of "The Sun Also Rises," which will have its world premiere at the main Edinburgh Festival this summer. The first world war is over, but some battles still rage on. Elevator Repair Service brings Hemingway's novel to life on a stage littered with liquor bottles and cafe chairs as the story winds its way through France and Spain, landing in the streets of Pamplona where bullfighting and the fiesta are in full swing. Recommended for age 14 and older. "The Sun Also Rises" is a co-production of ERS and New York Theatre Workshop. 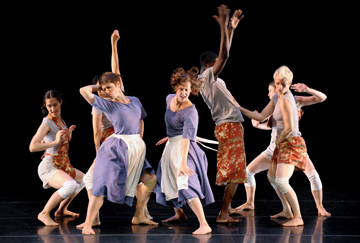 Commissioned by the Ringling International Arts Festival, John and Mable Ringling Museum of Art, in association with the Baryshnikov Arts Center; the Philadelphia Live Arts Festival with funding from The Pew Center for Arts & Heritage through the Philadelphia Theatre Initiative; and ArtsEmerson: The World on Stage. Peter Brook is a giant of contemporary theatre - a creative genius who, through his groundbreaking productions, has reinvented the way actors and directors think about their craft. His influential book, The Empty Space, explores the nature of theatre, as well as Brook’s theories on the purpose and potential of the theatrical form. Famous for his innovative approach, Brook worked on many productions in Britain, Europe, and the United State, in the 1950’s. 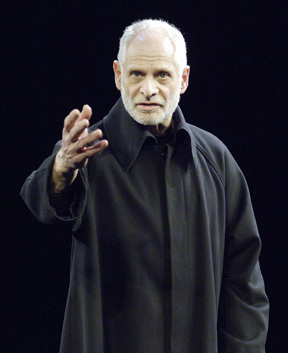 In 1962, he joined the newly established Royal Shakespeare Company for which he directed, among other productions, "King Lear" (1962) and Peter Weiss's "Marat/Sade" (1964). Hailed as one of the greatest Shakespeare productions of the 20th century, Brook’s 1971 "A Midsummer Night’s Dream" toured the United States, and was his last production seen in Boston (at the Shubert Theatre). Most of his work in recent decades is done with the Paris-based Centre for Theatre Research, which he founded. Among his films are "The Beggar's Opera" (1952), "Lord of the Flies" (1962), and "King Lear" (1969). 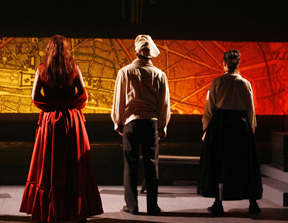 Peter Brook directs Marie-Hélène Estienne’s adaptation of The Grand Inquisitor scene from Dostoyevsky’s The Brothers Karamazov, a chilling parable about the perversion of religious faith. The action takes place in Seville during the Inquisition. In his infinite mercy, Christ returns to the world of man in the human form he wore during his 33 years on earth. He enters the burning streets of the city, where the previous day the Grand Inquisitor had sent a hundred heretics into the flames. The Cardinal Grand Inquisitor sees Him and his face darkens. He orders the guards to seize Christ and shut Him in a narrow vaulted cell. In the darkness, suddenly, the iron door opens and the Grand Inquisitor quietly enters. For a long moment, he stays in the doorway, studying the Holy face. Then he draws nearer, saying: “Is it You? 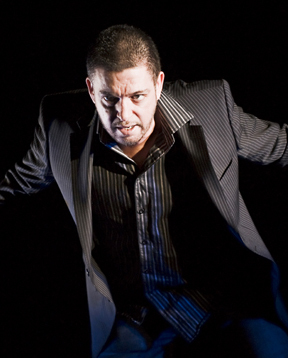 You?” Theatricalizing one of the most profoundly moral works in all of literature, Brook has created a one-man show of urgency and intensity. His minimalist staging of the Inquisitor’s monologue is no less than a naked inquisition of our age, our complicity and our answers to his questions. Recommended for age 12 and older. With his characteristic theatrical alchemy, Peter Brook stages a quintet of works by preeminent playwright Samuel Beckett—"Rough for Theatre I," "Rockaby," "Act Without Words II," "Neither," and "Come and Go." Brook’s long awaited vision of Beckett’s "Fragments" illuminates the comedy and courage in Beckett’s characters who dare to face the void. Says Brook, “Today, with the passage of time, we see how false were the labels first stuck on Beckett – despairing, negative, pessimistic. Indeed, he peers into the filthy abyss of human existence. His humor saves him and us from falling in. He rejects theories and dogmas, that offer pious consolations, yet his life was a constant, aching search for meaning.” With renowned international artists Hayley Carmichael, Antonio Gil Martinez, and Bruce Myers, Brook plumbs the depths of Beckett’s sparse, dynamic texts, revealing humor and humanity. Recommended for age 12 and older. 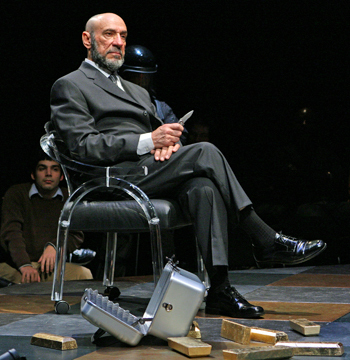 Oscar winner F. Murray Abraham stars as Shylock in this production from Theatre for a New Audience, fresh from hugely successful runs at the Royal Shakespeare Company in England and New York. A mysteriously melancholy rich man; a dashing young lover in desperate need of cash; a moneylender with good reason to seek revenge; and a witty young woman with a knack for disguise are the elements of Shakespeare's sparkling and troubling tragicomedy, in a new modern-day adaptation where cell phones and wallets replace messengers and moneybags. Recommended for age 12 and older. 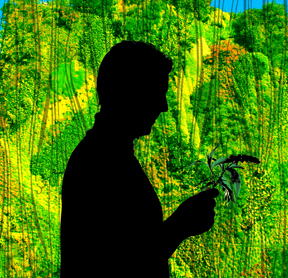 The wondrous, other-worldly "sensory gardens" of "Farfalle" (Butterflies) take audiences on a magnificent journey through a literal and symbolic story of a butterfly’s life cycle. 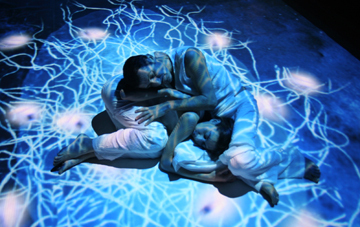 It brings together theatre and contemporary art and technology; at the centerpiece of "Farfalle" is the CCC (or “Children Cheering Carpet"), a special sensor-covered mat which interacts with dancers and the audience in real, enchanted time. Recommended for age 5 and older. Co-presented with The Celebrity Series. In addition to theatre, ArtsEmerson will present music, movement and multimedia works in the performance venues; classic and contemporary film in the Bright Family Screening Room; and workshops and discussions throughout the Paramount Center. Music, film and additional programming will be announced at a later date.